The word 'robot' was coined in 1920 by Czech writer Karel Čapek in his play R.U.R. (Rossum's Universal Robots). The word figuratively means 'hard work' or 'labour' in Czech and he coined it to describe artificial people that performed menial labour in the play. Of course the concept of an automated humanoid predates the name by perhaps hundreds, if not thousands, of years but this is the same word we still use today to describe the tens of thousands of automata that permeate culture both real and irreal. I invite you to consider the backbone of the 'robot' - the quest for the artificial human. This has remained unchanged since Eric (left) debuted in 1928 and even before. 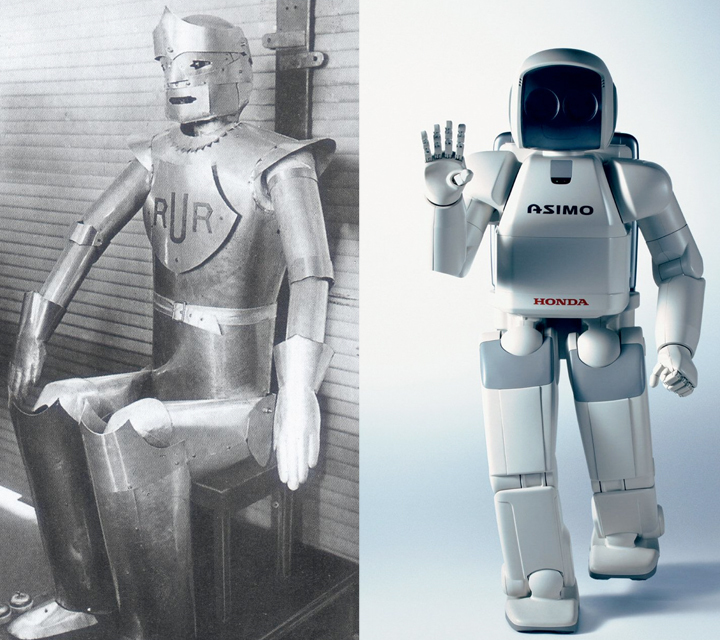 It has been continued up to the present and future incarnations of Honda's omnipresent Asimo. Over 90 years of pursuing the same technological goal - a humanoid robot. And for what prize? We all know they're falling into the uncanny valley and no matter what AI says, we won't want them in our homes. It's not as if this is even terra incognita. The critical debate of humanoid robots spans through endless cultural incarnations, with much the same result: Off the top of my head Star Trek, Blade Runner, Real Humans, Ghost In The Shell, the aforementioned AI, Isaac Asimov, I, Robot, the Alien franchise, S1MONE, RoboCop, Not Quite Human, Terminator not to mention the miasma of novels. Even robot naming seems to crash headlong into cliches, providing ground for some sort of robots of fact or fiction quiz - the Care-O-Bot with a name straight out of the Jetsons for instance. The name has kind of stuck and that's good. This is because like 'robot' it describes a purpose rather than describing the object itself. A spaceship is a ship for space, whatever form that is while a compact disc, for instance, can only be one form. But it's not like there's one categoric reality of what a spaceship is. The child in the imagination is drawn to the Tin-Tin style; all pointed tail fins and shiny red, more cadillac than zero gravity craft. Failing that you could probably say that the space shuttle fills a cultural gap, but now that's been mothballed with no viable successor. Besides which it was never really for space flight so much as a trip to the shops in astro terms. Ok, so maybe the Millenium Falcon? Yeah maybe, but most women I know hate Star Wars and the idea of a spaceship is at best some phallic and inexplicably moving tower which I would call a rocket. Say 'robot' and I bet we all draw the same picture. The spaceship suffers from obvious problems though. While the imagination for spaceships is vast, probably vaster than robots in fact. The criteria for their construction is somewhat... limited. Essentially they have to perform a very difficult task and no matter how much we might lust after falcons, the phallic objects are the only thing we can muster that actually does the job. 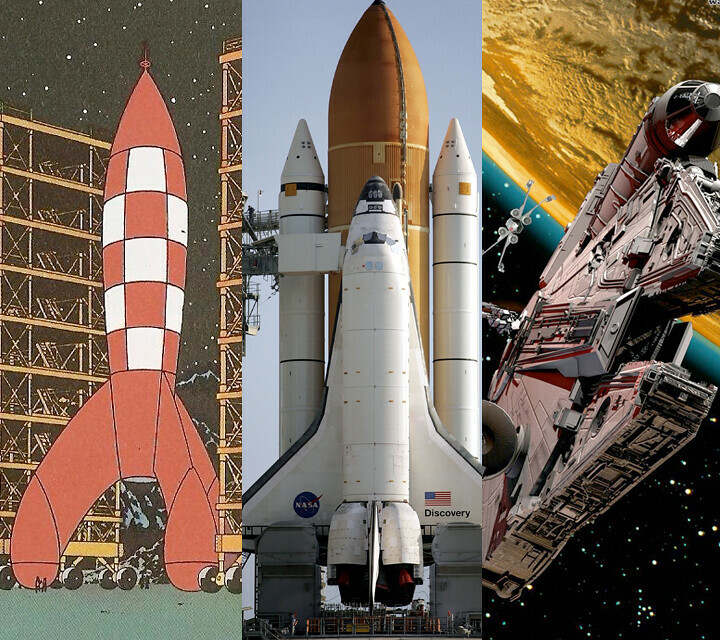 There's probably only a few dozen actual working spaceships. The same is not true of robots. The constraints are pretty much minimal, they could be as varied as life on earth but at the same time have none of the demand for life's foibles; heat, light, air, water, shelter etc. There are already thousands of robots operating in the world. Maybe not the human type, but in the broadest terms something that can make decisions and move itself. The imagination struggles to deal with such a vast definition and such a multiplicity of outcomes that perhaps we just default to the humanoid as the marker at the center of the theater of robots. Perhaps that's why we're still pursuing humanoid robots. The road is so smooth, so wide and limitless to a robotic future that there's been no need to pause and rebrand so far. Pecha Kucha at CSM's Narrative Environments.